Hybrid Solar Systems. Better than going off grid? Do you hate the electricity companies? Do you marvel at the electricity-generating ability of a decent-sized solar power system? Pretty natural thought process, right? And modern technology does agree with you – if cost isn’t a factor. For reasons I’ve outlined in another post it is possible to go completely off-grid with a big old pile of batteries and a boatload of cash. I’ve taken some heat for suggesting that going completely off grid may not be a great idea if you have a grid connection at your doorstep. After all, there’s nothing inherently wrong with the grid. It is an amazing bit of infrastructure that has already been built, works very well 99.9% of the time and allows us to share our excess energy with our neighbours. “Think twice before spending $30,000 to $50,000 to go off grid in the city!”. The objective truth is this: Off grid can make sense for you in certain situations (which I outlined in my original off-grid post), but otherwise it is a whole lot of expense for no other reason than a vague desire to “stick it to the power companies”. Luckily for us, there’s a compromise: hybrid solar systems! Hybrid solar power systems offer the best of both worlds: You get the guaranteed (well, 99.9% of the time) electricity supply of the grid, with the ability to store your excess solar energy in a battery for use when the sun isn’t shining. You can also switch over to your own battery reserves if the grid goes down. Hybrid systems are also at least half the price of an off-grid system and don’t require diesel back up. They’re still more expensive than a purely on-grid system, but the benefits of solar batteries are persuading an increasing number of people to pay the premium. In fact, the number of hybrid enquiries to this website is doubling every year. Standard on-grid solar power systems shut down if they detect the failure of the grid. This is to protect any lineworkers making repairs to the wires outside your home. They wouldn’t like it very much if your solar panel system sent a current straight to their fingertips while they’re trying to work on the wires in your street. 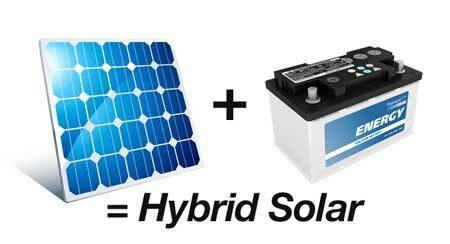 A properly designed hybrid solar system can safely disconnect your house from the grid in the event of a power outage, and turn your house into a little mini grid. Imagine the smugness as yours is the only house in the street with the lights on, the TV blaring, the fridge humming and the beers cold. Some unlucky folks have local electricity networks that are real control freaks. They have really tight restrictions on maximum solar system sizes. They claim their poor little grid can’t handle the additional electricity that larger solar power systems provide (although they’ll be happy for you to install a 10kW air conditioner that intermittently pulls massive amounts of power from the same grid!). This often results in homeowners being forced into a solar power system size much smaller than they need to offset their bills. The way that hybrid solar systems get around this limitation is by using a smart inverter that works in tandem with your battery bank. These hybrid inverters can be configured to have a maximum export rate that’s way below what your system can actually produce when the sun is at full whack. So to the grid your 10kW solar power system can look like a puny 2kW system. While only 2kW is exported to the grid, the other 8kW or so is diverted to your batteries. The result: Everyone is happy. You get your big solar power system, and your electricity company gets to stay in the 20th century with its arcane regulations. You just have this strong feeling that it’s unfair to send your generated solar electricity into the grid for half (or less) what you pay the power company. So – by dropping a lot of cash on a battery, you can get your bill to as close to $0 as possible. I personally fall into this category! I’m what you’d call a solar geek, and I love testing new technology, so putting solar battery storage on my home was a logical choice. I already have a regular solar power system – can I add batteries? To make a standard solar power system compatible with batteries, I’d suggest a system size of at least 6.6kW so you can generate enough electricity to actually charge your batteries in the winter, and when the weather is overcast. If you currently have a system that’s under 6.6kW in size, you should consider adding more solar panels, unless you have a really efficient house and a really small battery pack. If you are adding panels, you may need to increase the size of the inverter to cope. It is actually fine (and often a very smart move) to oversize your solar panel array to your inverter. More kW won’t harm the inverter (as long as the voltage and current specs are maintained – which your installer can confirm). Your installer can advise on whether your inverter needs to be upsized based on your local climate, your battery size, and your household energy usage. The simplest way to retrofit batteries to an existing solar power system is to use a technique called “AC Coupling” – which means you don’t touch the existing solar wiring, and simply connect the battery into the houses existing 230V AC circuit. Examples of batteries that can be retrofitted using AC Coupling are the Tesla Powerwall 2, the Enphase AC battery and the Sonnen battery. How much does a hybrid solar system cost? Now we’ve reached the million-dollar question: How much extra can you expect to pay for a hybrid solar power system compared to a standard, on-grid system? It all depends on how many batteries you want. But the short answer is: you’ll pay more than double for a hybrid solar system. At the time of writing, a good 6.6kW system costs about $7,000 installed. If you want to add 10kWh of usable storage (a decent amount for the average Aussie home) to this, expect to pay about $18,000 for the complete system. What kind of batteries can you use for a hybrid solar system, and how often will they need to be replaced? There are now a wide variety of batteries available for the home residential market, and you can see them all on our Battery Storage Comparison Table. In terms of lifespan – we aren’t seeing many battery manufacturers warranting their batteries for more than 10 years – that should tell you all you need to know about how long they expect them to last. Is hybrid solar worth the extra money? At the time of writing (February 2019), if you are buying a battery for purely economic reasons, it’s unlikely to pay for itself before the warranty expires – which suggests they are not a good economic investment yet. However, if you are buying a battery for the other reasons we mentioned above, then only you can put a price on those reasons and just how much they’re worth to you. One thing to be careful of the concept of “blended payback“, where a solar company will sell solar + batteries in a package and rely on the incredibly fast payback of the solar panels to reduce the otherwise uneconomic payback of the battery system. 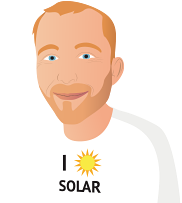 If you want 3 competitive quotes for a hybrid solar system, from local hybrid specialists (including payback calculations), you can get them here.